As I'm reading through the Bible chronologically this year, most of my posts, for now anyway, will be related to to Bible folks and situations in the early times covered in His Word. And the first person who grabbed my attention was Noah. You can find his story in Genesis 5:28-9:29. He is also mentioned in Isaiah 54:9, Ezekiel 14, Matthew 24:37-39, Luke 17:26-27, Hebrews 11:7, 1 Peter 3:20, and 2 Peter 2:5. First, the genealogy and some facts and figures: Noah was the firstborn son of Lamech and the grandson of Methuselah (the longest-living man reported in the Bible - he died at the ripe old age of 969). Noah was 500 years old before he had children, when he had three sons: Shem, Ham, and Japheth. 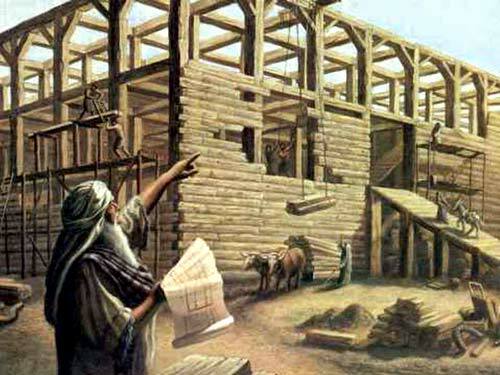 He boarded the ark at the age of 600, and he lived 950 years total. Noah lived in tough times. The world around him was desperately wicked, and "every inclination of the thoughts of the human heart was only evil all the time." (Genesis 6:5b) And God had had enough of it. He decided to wipe the earth clean of humanity, the animal kingdom, and the plant kingdom. Desperate measures, to say the least. But in all the wickedness of the world He created, and that sin corrupted, there was one man who didn't turn the Lord's stomach. And that man was Noah. So God chose him, among all the people who populated His world, to survive. And his family - his wife, their three sons, and three daughters-in-law. But that was IT. God's Word tells us of Noah's favor in God's eyes, and of his righteousness, blamelesness, and faithfulness, but it also shows us these very same things. 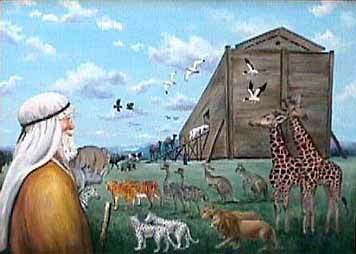 Noah took care of the hundreds of animals on the ark without complaint - for a full year. And we can do the same, with the help of the Lord, and the inspiration of Noah. Have you ever felt like Noah? Do you find him to be an inspiration? What is your favorite part of his story? I'm inspired by Noah's commitment. He did not fold under the scoffing. But when you said, "And sometimes we wonder if following Him is really worth it - or possible with all the worldly influences and temptations," what came to my mind was John 6:67-68. I feel like Peter when he said, "Lord, to whom shall we go? You have the word of eternal life. We have come to believe and to know that you are the Holy One of God." I LOVE this thought about Peter, Zoe! If we continue to remember that there IS nowhere else worthy to turn, our commitment to him seems much easier - even if the whole world (it seems, anyway) is going the other way. I'm reading my one year chronological Bible this year too! And I read about Noah yesterday! This is gonna be great! I do think Noah is inspiring. When I really sit and think about what he must have gone through--what his family must have endured. It definitely encourages me to keep building on the promises God has given me, no matter what anyone else says or does. To be diligent. Faithful to complete the purpose given me. To work each day. You can't build an ark in a day. But putting quality time in every single day pays off. God didn't send the flood until the boat was finished. :) I love partnering with God! And that timing thing is CRUCIAL to remember - and trust in, isn't it? And working toward something - taking the right next step, and the next, and the next. I loved your reminder of the immense patience Noah had. Oh, how impatient I am! God will give me a command or a promise, but as I wait, doubts or complaints come in, threatening to steal my joy and focus. Great post, Jo! Don't we hate when God's answer is "wait?" I'd much rather had a yes - or even a NO! But we grow so much closer to Him while we wait. Patience is a virtue, they say - and something worth developing. So glad God will help us with it. Thanks, Caroline. Noah is definitely fascinating - and the epitome of patience and trust. I love it that Noah built the Ark with nothing but God's directions. No special conferences or internet classes. Sometimes I feel overwhelmed by all the things I've learned about writing. Maybe I don't know what to do first, or maybe I'm afraid I can't do it as well as I want to. Like Noah, I will resolve to look to God first for my instruction. Looking to God first is SO important - especially with all the "noise" around us about EVERYTHING (writing included). Thanks for this extra little insight, and for stopping by! God bless you for sharing this with us, Joanne. It's very enlightening.